What did you learn whilst involved with this project? My answer: I attempted to further my social documentary photography by funding this project Creating Sanctuary. I aimed to demonstrate a model and style of communication, where you create a narrative and imagery that relates closely to communities, home & place, with story telling framed around it. 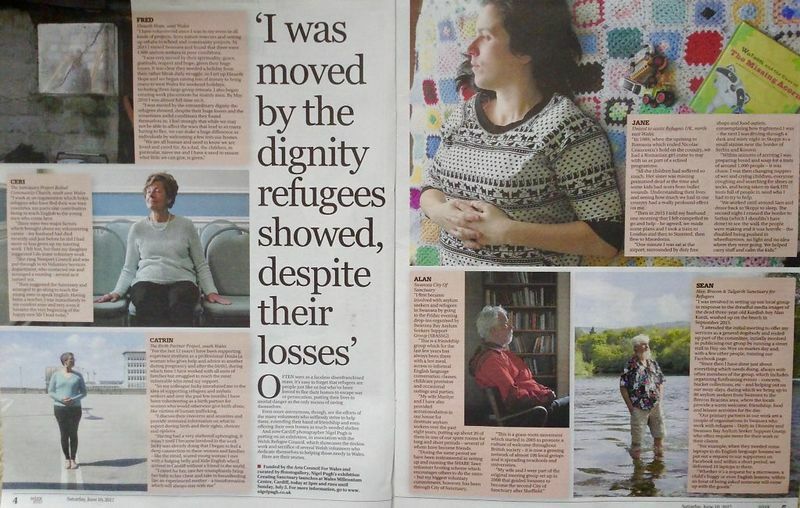 With the questions that I asked of all of the volunteers featured I allowed for that story to tell and address the wider picture, and the issues that relate to the topic; the plight of those refugees seeking sanctuary in Wales, the displacement of people worldwide. The voice of the story is not overtly mine, but the authentic voice of every day relatable people from communities from all around Wales. Yes how I chose to frame the photos and questions was my voice, in co - production with the related organisations and the volunteers featured. In aiming to demonstrate basic human commonalities, I framed my photography loosely around, home - sanctuary, community - sense of place and their voluntary work - purpose. Refugees whoever they are where ever they are from, they have had these basic human requirements partly or wholly removed. Thus far the response, the feedback has been really positive and engaged. Those that who have engaged with the exhibition thus far have expressed empathy, compassion and understanding, for migrants and their plight. In answer to 'Show Racism The Red Card' original question, "What did you learn whilst involved with this project?" I have learnt that this way of trying to sensitively raise an issue and then to create engagement or empathy, thus far seems to be effective, drawing wider coverage and interest. This methodology has not been an accident, it was partly based on a awareness of academic research from climate outreach. Story telling research, the Stories of Change project of which I was not aware of. Relatable imagery and authentic voices have for a long time been recognised as a great communicator to engage a wider public. One of the equal, if not more challenging aspects of social engagement, is the funding of, and the effective marketing of, placement of. We live in a world of noise, loaded with sales, and agendas, that are not necessarily there for global equality and wellbeing. The real test will be if the exhibition goes closer to those communities featured. Which will take funding, as in part of the original concept. "the touring venues being as close to the participants as possible, increasing the identification with community members and locations." Will a greater uptake and engagement with supporting refugees happen? Will it assist the 'City of Sanctuary' movement in Wales to become a leader in becoming a 'First Nation of Sanctuary'. This is a record of the coverage thus far, which will be updated as the project developes.